This January, as we continue our discussion of goals, it’s crucial to understand once we make goals, the next step is organization. Whatever your goal, making progress relies on being organized. For some of us who find great satisfaction in organization, this is an easy step. But even if this is not your strength, organization will make achieving goals a reality. If this integral step is skipped over, goal achievement will suffer. 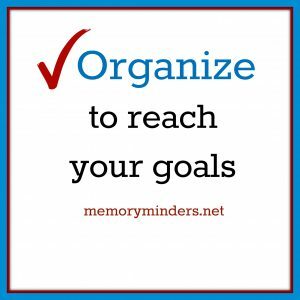 At MemoryMinders, we discuss organization as a memory technique. Think about it-if we are organized, there’s less to remember. We don’t have to remember everything, just where to find the information needed. Let’s look at the examples of eating healthier and exercising mind and body-all great brain wellness goals! To eat healthy, I need to have a plan for our meals, and then grocery shop based on the meal plan. It may seem simple, but this takes planning on various levels. First, the menu plan includes evaluating my family’s schedule for the week. I look at which days are busy and need a quick meal etc. then assign meals to specific days. I look at the grocery store flyer for what is seasonal or on sale, plan the grocery list and when to visit the store. When all of this happens, (which isn’t always every week) things run more smoothly. I have a plan, and even if I need to adapt, I can switch to a different healthy meal because I have all the ingredients. It eliminates the bad choices and makes the goal of eating healthier more successful. Exercising my body regularly is another goal. Personally, if I don’t exercise early in my day it probably won’t happen. So I try to fit in it in the morning or plan time by midday. I organize my nights and days to make it a priority. This means getting to sleep at a regular time and being organized in the morning to fit in the exercise. I also made a goal to vary how I exercise my mind. Reading various types of books changes the way my brain thinks. Once the busyness of January began, I knew I wouldn’t have time to find new books. I organized my time over the holidays to purchase a few new books. I already read one and am excited to read more. They are sitting on my bedside table as a visual reminder to read a bit each day. 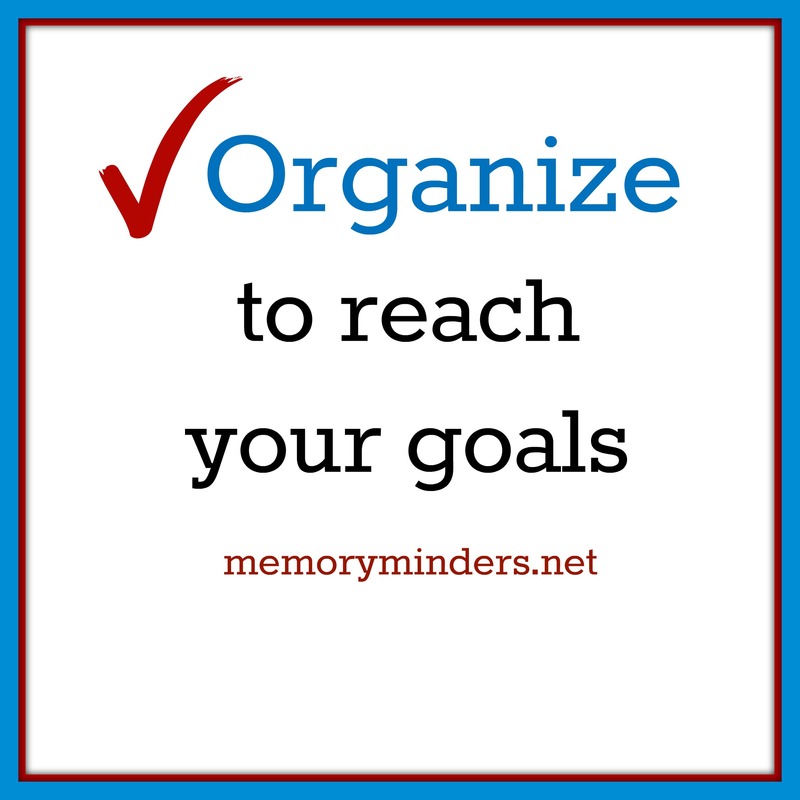 Again, being organized makes the goal accessible and achievable. Organization. Embrace it, use it and allow it to help you stay on track with your goals. Until next Mindful Monday when we discuss how to persevere with our goals, let’s get organized! Hi Jill. Is there an organization expert you know of for homes? can you recommend a strategy to lengthen my personal focus period so I can complete tasks? Feel free to call me and I can assist you. Thank you!